Vector Unit Games Coming to Windows Phone 8.1! One of the most oft-repeated questions we get from fans is "When are your games coming to Windows Phone?" Well guess what Windows Phone lovers, your time has come! Over the next 2 months we'll be releasing not just one, not two, but THREE of our most popular games on Windows Phone 8.1. Beach Buggy Racing, Riptide GP2, and Shine Runner will all come to the platform during the month of November. 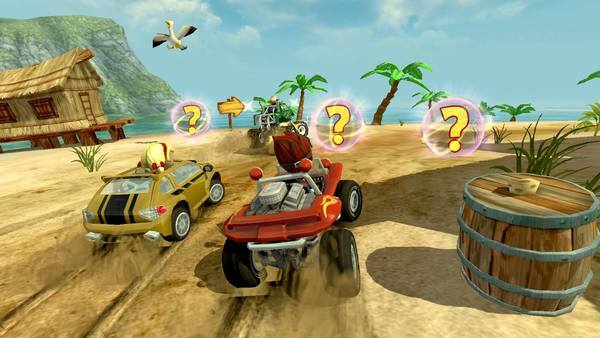 Beach Buggy Racing and Shine Runner will also join Riptide GP2 in the regular Windows 8.1 App Store. So whether you're playing on a Windows phone, tablet, or desktop PC, Vector Unit's got you covered. We had previously reported that Riptide GP2 would be coming to Windows Phone the first week in October. However, working closely with Microsoft we decided it would be better to hold Riptide GP2 a little longer so we can bring it along with our two other games in November. Sorry for those of you who are disappointed at the delay, but we hope you agree it'll be worth the wait! Beach Buggy Racing, Now with More Amazon! Our new kart racing game Beach Buggy Racing™ is now available on the Amazon Appstore, for Fire TV, Kindle Fire tablets, and Fire Phone. Heck, you can get it for your regular Android phone too! The Amazon version uses Game Circle for Achievemetns and Leaderboards, and your Amazon account for cloud syncing. The experience is extra-special on FireTV, where if you have a couple of controllers you can enjoy split screen kart racing goodness the way it was meant to be played! Heck, it even works with one player on the remote and another player on a controller! 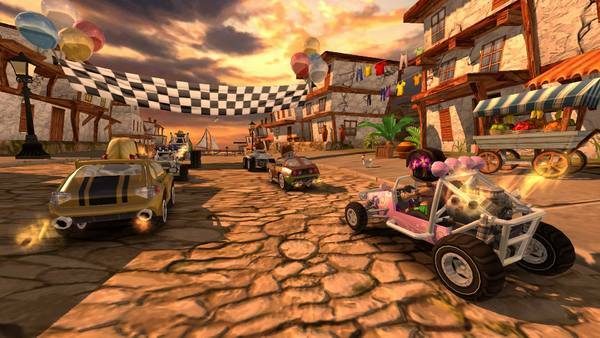 Beach Buggy Racing Zooms on to App Store, Google Play TODAY! HUZZAH! After more than a year of working, polish, tuning, and playing, the Vectcor Unit team is proud to announce the release of our fifth mobile game, Beach Buggy Racing™! As these badges probably tell you, the game is currently available for iOS and Android. In the coming weeks, BBR will also be coming to Amazon Kindle devices, Windows Phone 8.1 and Windows 8.1. Stay tuned for those announcements. We could tell you about the game... or you could just sit back and watch our brand new trailer! Thanks to all our fans who have been patiently waiting for this game, particularly to those of you who only emailed us every OTHER week to ask when it is coming out. We appreciate your support, and really hope you enjoy playing the game as much as we've enjoyed working on it. ...Which, by the way, we are still doing! We plan on releasing a couple of updates in the coming months, including new powerups, new characters and cars, and more! Beach Buggy Racing Beta Open to the Public! UPDATE: The Beach Buggy Racing Public Beta is now closed. Thanks to everyone who's been helping us test the game! We may open the beta up again at some point, for now we're not taking new testers. 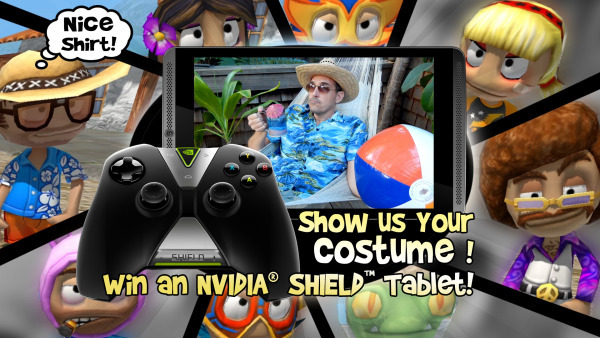 We are in the final weeks of polishing and finalizing our newest game, Beach Buggy Racing™, and we need your help! If you have an Android phone or tablet and would like to play a beta version of Beach Buggy Racing before anyone else, please join our Public Beta! You'll be able to download and play an almost-finished version of the game, send feedback directly to the development team, and get a head start on the rest of the world! You'll be asked to apply, and you'll receive a response within 24 hours, after which you'll have full access to the game and the feedback forums. We really value your feedback and can't wait to hear what you think of the game! The software is still under development. Some elements of the game -- such as the prices of cars or powerups -- are still being tuned and may change without notice. You may encounter bugs and problems in the Beta software that, among other things, cause you to lose your save game progress. It's not likely that this would happen; we've tested the game a lot already -- but it's possible. This game contains In-App Purchases (IAP)! That means you can buy stuff like coins or gems for real money. We do not expect that you will have any transaction problems with IAP, but in the event you do have a problem receiving the item please contact us directly at support@vectorunit.com and we will help you recover it or refund your money. Any IAP you make during this Beta test period will stay valid in the final version of the game. You will not lose your IAP when the game goes live. When we originally announced Beach Buggy Racing™ at Google I/O, our plan was to release it in August. At least that's what we told everybody. But the game just keeps getting better the more we work on it, and we have decided to push it back another month to give us more time to make it really solid before we ship. So our new ship estimate is "September 2014". We're shooting for mid-September, but it's possible it'll be a little later. We'll announce a specific date a couple of weeks before it actually ships. For those of you who just can't wait to get your hands on our newest creation, we are going to open up a public Beta test period sometime in the next 2 weeks. During this time you'll be able to play the almost-finished game and give feedback directly to the team. This public Beta is only going to be available to Android users, at least at first. Stay tuned for a specific announcement and instructions on how to sign up for the Beta, and play Beach Buggy Racing before anybody else! San Francisco – June, 24, 2014 – Independent game developer Vector Unit Inc. announced today the launch of its latest mobile driving game Beach Buggy Racing™for Android, iOS and Amazon devices. The second in the popular Beach Buggy game series, which has had over 30 million downloads worldwide, Beach Buggy Racing pits players against each other in an action-packed world of playful, off-road kart-racing mayhem. Players race to the finish line around 12 richly detailed tracks, through dinosaur infested jungles, lava-spewing volcanoes, sun-kissed beaches and mysterious swamps. Tracks are filled with secret shortcuts, and magical powerups that boost, smash, shoot and bounce drivers to the front of the pack. New drivers can be unlocked and recruited, each with a unique character ability, like teleportation, flaming fire tracks and Tiki spells. Players can also collect and customize new vehicles for the ultimate thrill ride on sand, ice, fire and more! And what kart racing game would be complete without split screen play? 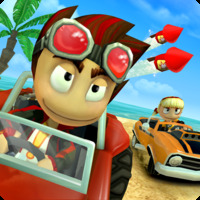 By connecting two to four Bluetooth game controllers, players can compete shoulder to shoulder to shoulder on a single device in Beach Buggy Racing’s thrilling Split Screen game mode. Players can also challenge Facebook friends online and earn achievements with Google Play Game Services (Android), Game Center (iOS), and GameCircle (Amazon). A challenging and addictive kart-racing adventure for all ages, Beach Buggy Racing will be totally free to play on Android, iOS, and Amazon Kindle devices later this summer. Attendees can get a sneak preview of Beach Buggy Racing’s split screen mode at Google I/O this week on the 3rd floor at Moscone West in San Francisco! 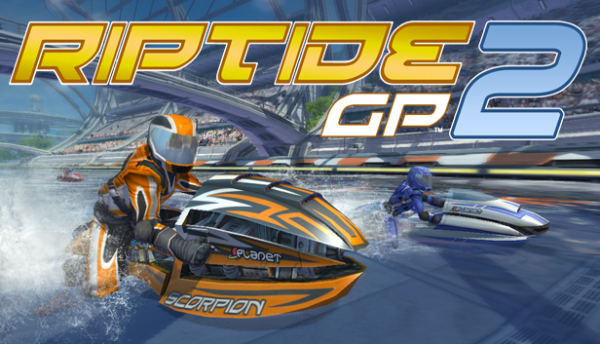 Riptide GP2 Steam Update #1: Multiplayer Improvements! We just released our first update to the Steam version of Riptide GP2, which includes a handful of asked-for feature enhancements and a few minor fixes. All users are strongly encouraged to update to this latest version, since you'll need it to enjoy online multiplayer games on Riptide GP2 going forward. But also becasue it's awesome. Allows you to see who else is in the Lobby with you. Allows you to join a Match that's in progress at the next Race start. Shows you the status of each racer while you're waiting. Allows up to 6 players to race simultaneously! These improvements and others should make it a LOT easier to join multiplayer matches, and to get matches going with 4, 5, and 6 players. Fixed Cloud Sync issue for save data. You can now sync properly on multiple machines. QuickMatch now tries to join you in lobbies with people from your friends list, if found. Thank you for all the great feedback! We maintain a prioritized list of issues that are reported by our players so don't hesitate to hit is up for fixes, changes, etc. 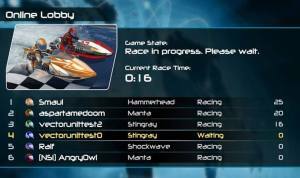 in the Steam Riptide GP2 Official Game Group Discussion Forums!